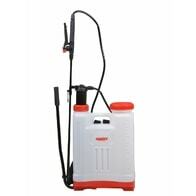 Manual piston powered knapsack sprayer with tank volume 12 litres and maximal pressure 4 bar. Equipped with adjustable spraying jet and release lock. 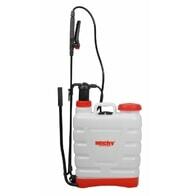 Manual piston powered knapsack sprayer with tank volume 16 litres and maximal pressure 4 bar. Equipped with adjustable spraying jet and release lock.